We’re excited to introduce ~~~R Wave~~~, our contributing book reviewer! If you’re looking for good reads on subjects such as sustainable farming, self-reliant living, and the future of agriculture, then you’ll want to follow ~~~R Wave~~~. There are many excellent gardening books available today, from general books on organic, sustainable methods to books devoted to one or two species of produce. I will review several of these books in the future. 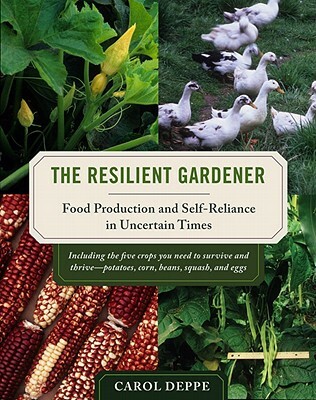 One such book stands out, however, for its emphasis on what the author calls “resilience.” Carol Deppe, the author of The Resilient Gardener; Food Production and Self-Reliance in Uncertain Times , (Chelsea Green Publishing, 2010) is a microbiologist and geneticist as well as a successful gardener and plant breeder. (She has authored another phenomenal book on plant breeding called Breed Your Own Vegetable Varieties; The Gardener’s and Farmer’s Guide to Plant Breeding and Seed Saving. I will review that book at a later time.) For Deppe, “resilient” gardening is a style of gardening that employs methods and species that can supply the staples that will provide the nutrients for health and sustenance even when times are hard and resources scarce. She is not an alarmist and avoids dire predictions about the future. The book does, however, include a discussion of global warming and climate change and of how humans coped with the Little Ice Age in Europe which began in 1315 and ended around 1850. Deppe’s advice for the resilient gardener is to raise five essential staple “crops” to supply all the essential protein and carbohydrates for a healthy, complete diet year round. Those crops are potatoes, corn, beans, squash, and eggs. Additional essential vitamins and minerals can be provided by traditional vegetables such as tomatoes and greens. The book is written for both the beginning and experienced gardener and contains detailed and practical advice on every aspect of growing a resilient garden. It includes advice on various plant varieties, recipes for those with gluten and dairy intolerance, and root cellaring and dehydrating for long term storage. Many of us are concerned about the future. The sheer number of the challenges that face us, including peak oil, climate change, species extinction, economic collapse, infrastructure failure, and even nuclear war, have the potential to overwhelm and immobilize us. The survival of our species is by no means assured. Fortunately, millions of people throughout the world are fashioning visions of lifestyles and social structures that might see us through these crises. Two key concepts shared by most of these visions are sustainability and localization. It is tragically obvious that the centralization and monopolization of our industrial and financial sectors are decimating the planet and its inhabitants. In particular, big agriculture is clearly unsustainable, with its near total reliance on fossil-based fertilizers and pesticides, colossal machinery running on increasingly expensive diesel fuel, horrific animal concentration camps, and tremendously long supply chains. It seems clear to millions now that local, sustainable agriculture is the only viable alternative to the industrial agriculture model. We have learned an enormous amount about gardening, farming, and animal husbandry since our grandparents and great-grandparents farmed this country. We can now take the best of our traditions and supplement them with modern techniques and materials. Carol Deppe’s vision, eloquently presented in her book, provides a way that we can all become more self-sufficient by producing our own locally grown food using sustainable methods. Her approach may be more than merely interesting and appealing; it may be essential. This post inspires me to be even more intentional in my gardening this year, and to plan a larger planting, in order to share with my fellows. Especially as I sit inside with snow and bitter cold, what a joy to look toward that tiny plot out beyond the onion patch. Thank you for the inspiration. Stay tuned! ~~R Wave~~ is bound to be sharing more inspirational reads with us in the future.